Spring is here! Serving the constituents of the 36th Senate District is very important to me, and I encourage you to contact me with any state issues. You may call toll-free at 1-855-347-8036 or email senjstamas@senate.michigan.gov. Also, please check out my Facebook page. Let me know if I can assist you in any way or if you have an idea to help move our state forward. I recently welcomed the Michigan Academy of Family Physicians to the Capitol. It was great to see Dr. Aloff and the wonderful medical students who are preparing to meet the health care needs of Michigan families. We talked about the important role they play in providing patient-centered care and reducing health care costs. 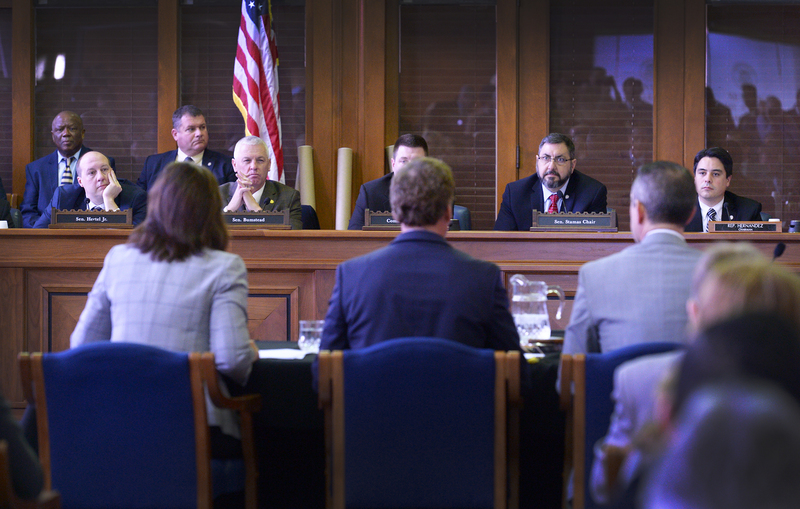 As the Senate Appropriations Committee chairman, I recently led a joint committee meeting to hear Gov. Gretchen Whitmer present her fiscal year 2020 state budget recommendation. I also recently appeared on Off the Record to talk about the budget and some of the governor’s proposals. This is the beginning of the budget process, and I am committed to working with my Senate and House colleagues and the governor to pass a responsible budget that helps build a better Michigan for families, workers and job creators. With smart budgeting, we can continue to fix our roads and infrastructure, support our schools and our students, keep our state on solid financial footing, and promote efficient and effective government. We must continue to invest in Michigan’s future. Over the last eight years, we have increased state funding for schools by $2.2 billion, and we’ve put $2.8 billion in new investment into our roads since 2017 — but more needs to be done. As we work to once again pass a balanced budget ahead of schedule, I look forward to hearing from Michigan families and residents about their priorities. In Michigan, police can seize assets from people as evidence or as part of an investigation if they have a reasonable suspicion that a crime has been committed. After the assets are seized, law enforcement can petition the court to forfeit the assets to the police agency that seized them. I recently supported legislation that would preserve this crime-fighting tool while helping protect innocent Michigan residents from losing their property to civil asset forfeiture. Senate Bill 2 would require a person to be convicted of or plead guilty to a crime for the seized property to be kept. An individual’s personal property would be returned if they are not charged or are found not guilty. Law enforcement in Michigan seized about $13 million in assets in 2017, according to the Michigan State Police. Out of the 1,700 forfeiture proceedings, only 43 percent of those whose property was seized and forfeited were charged and convicted of a crime. Monitoring the health of aquatic life is an important part of fisheries management. People can report fish kills over 25 fish by completing the Sick or Dead Aquatic Species observation report at www.michigan.gov/eyesinthefield. Most of the time, fish kills are due to natural causes such as weather but they can be related to disease, pollution, chemicals or other nonnatural causes. If you love camping, now is the time to consider booking a campsite at a Michigan state park! Many popular sites fill up early, especially those closer to the water. Campsite reservations can be made up to six months prior to the date of arrival online at www.midnrreservations.com. This year is the 100-year anniversary of Michigan state parks. Find more information on our natural and recreational treasures at www.michigan.gov/stateparks. A state recreation passport is needed for park entry; campsite fees are extra. The 36th Senate District is made up of 10 counties, which includes: Presque Isle, Otsego, Montmorency, Alpena, Oscoda, Alcona, Iosco, Arenac, Gladwin and Midland counties. Thank you for subscribing to my electronic newsletter! I am honored to represent you in the 36th Senate District of Michigan. As always, please do not hesitate to contact me if you have any questions or concerns. Please feel free to forward this on to others who may be interested in receiving the 36th District E-news. You may sign up for it also at my website or via Facebook. 100 N. Capitol Ave., Room S-324.